Earning their third consecutive title, and fourth in five years, Chino Hills HS (CA) (Gold Medal – 97.975) portrayed the struggles of alcoholism in “The Vine Wound Tight.” A haggard man sat at a table with a glowing green bottle, desperate to kick his addiction. Whenever he tried to walk away, leafy vines kept wrapping around him, pulling him back to the bottle. Voiceovers of his wife describing the toll his drinking has on his family ran through his mind. When she told him they were going to have a baby, he made a decision to try to stay sober as backdrops turned to show an infant’s hand, causing him to ask if this was his child’s future. While the man never took a drink during the show, the temptation was always in the forefront. Arcadia HS (CA) (Silver Medal – 97.3375) performed “One of Us” on an abstract set featuring two rows of different colored curved poles, round hoops, and two-foot tall semicircles, all of which were utilized during a program of avant-garde performance art. While there was no storyline, the underlying impetus was a young lady working to inspire her colleagues to form a more cohesive unit as the modernist look allowed the viewer to insert one’s own meaning. The center movement of Stardust with lyrical choreography was pure artistry. As the poles folded and moved, the group created a variety of visual flavors, culminating in a dynamic, evolving finale which concluded with the woman hoisted in the air. Avon HS (IN) (Bronze Medal – 95.1625) opened “Enough” with a whispering crowd over their speakers, before one person said “Enough!” and sat down to play Clair de Lune at a grand piano. Members wore noise-reduction headphones, drowning out unwanted noise. Set on a floor filled with yellow and magenta sound waves with matching costumes, the group built tension, ending with exclamations of “enough!” when it became too much. As the closer Don’t Stop ‘til You Get Enough built, a feature with 8 quads wasn’t yet enough. A superb hard rock guitar solo drew huge cheers right up to the high-energy ending. The crowd couldn’t get enough, rising to their feet with glee. Rule #1 when gambling: The house always wins. A card player learned that lesson the hard way for Dartmouth HS (MA) (4th – 94.8875) with “All In (A Dance with Addiction).” The man sat down at a casino card table, and made the bad decision to keep playing after a few wins. Large playing card flats showing the back of a deck of cards turned to reveal the card faces. The battery, dressed as Kings, Jokers, and other cards, displayed phenomenal technique. The gambler decided to leave, but the Queens danced with him, luring him back to the table. After losing more money, he exclaimed “I’m done!” and pushed the cards over, leaving in frustration with a lighter wallet. 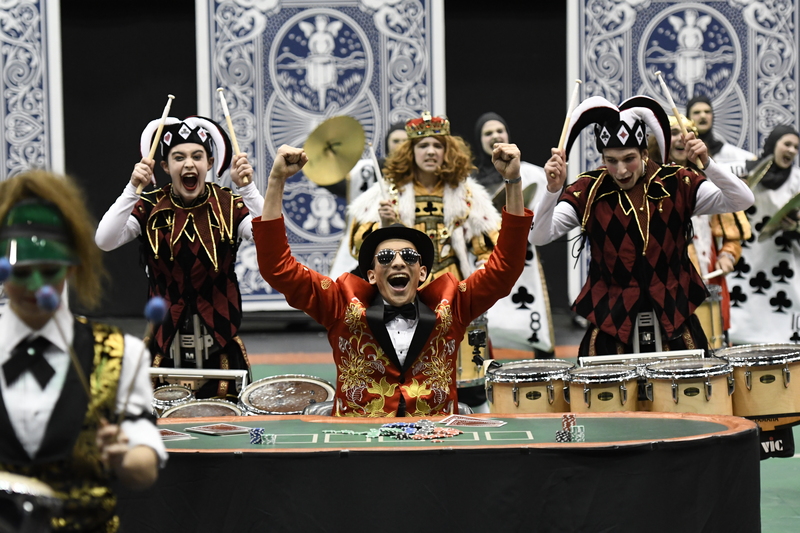 Ayala HS (CA) (5th – 93.9625) pondered what if children never went outside with “The Indoor Generation.” Performed on a floor representing the inside of an infected lung, red blood cells (drummers) struggled to ward off infectious bacteria, depicted by a visual ensemble. A young girl lamented how her generation spends over 90% of life inside with electronic devices, stating houses have become ”prisons we were never meant to leave.” Harmful health effects of never venturing outdoors were a motivation for the program. At times, members tried to leave through a red door, but were dragged back inside before they could reach it. Set on a black floor with purple swirls leading to a large curved stage, Burleson Centennial HS (TX) (6th – 92.900) were a group of creatures attempting to save their species in “The Vessel.” Opening narration described a project attempting to rescue humanity as the line waited for a signal. The battery, covered in shiny silver leafs to start, emerged in silver insect-like costumes. The signal finally arrived and soon the floor was awash in color via costume changes and large leafs of varying hues. The hymn The Corinthian Song rang from the speakers in the closer, allowing the viewer to input personal overtones of hope into the underlying concept. 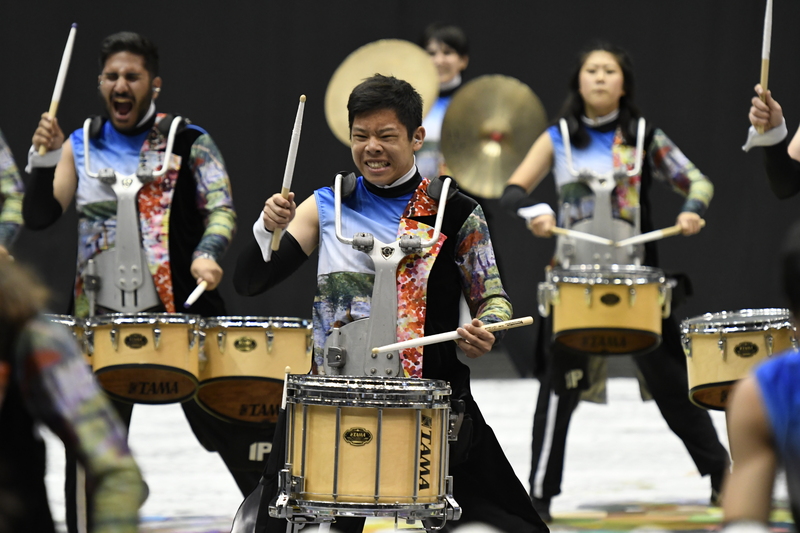 Etiwanda HS (CA) (7th – 92.675) opened with a disturbing scene which was repeated bit by bit in “It’s Just Us.” A couple had an intense argument with shouting and screaming at the start. The woman pushed the man away when he fell and fatally struck his head on a red table. Round bases with tall triangular fabric leading up to halos were occupied by figures in all black and all white, representing the two sides of the argument and illustrating the emotions of the couple through movement. As the show progressed, the argument replayed in brief snippets, as the woman’s thoughts and horror at the aftermath were heard through voiceovers. At first glance, the mélange of color on the tarp for Homestead HS (CA) (8th – 91.4375) may have had little meaning, but as “The Space Between” developed, it became clear there was much more than met the eye. The colors were actually large dots of paint, and images of Seurat’s pointillist masterpiece A Sunday Afternoon on the Island of La Grande Jatte on video screens showed us that what we saw was only a very close-up view. The line looked at the painting and technique in a new way, as video screens showing streaks of colored light combined with lit colored orbs carried by the battery to further drive home the pointillism element. Jerry Seinfield had a hit television show about… nothing. 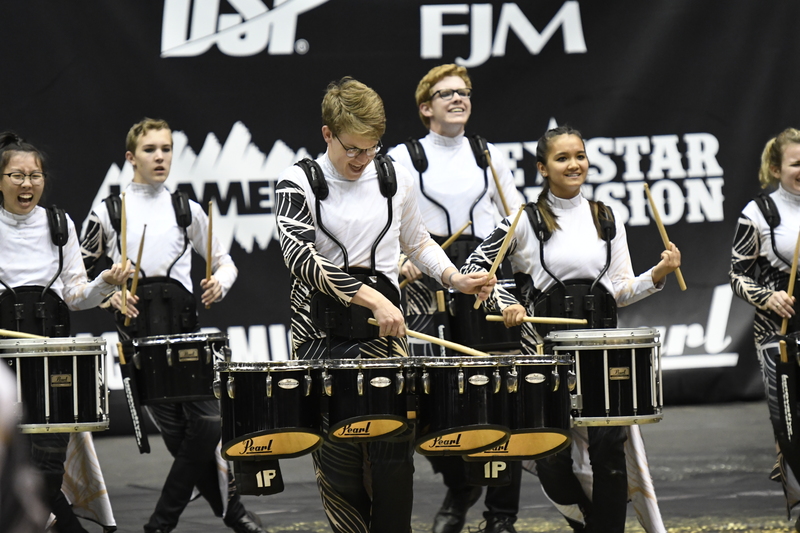 Franklin Central HS (IN) (9th – 90.2125) applied his inspiration to indoor percussion in “About Nothing,” including a whole movement devoted to gibberish. Performed on a set with a television test pattern tarp with matching tall backdrops, staircases, and costumes, the program featured voiceovers of Seinfield and George Costanza pitching a show idea about… nothing. The ingenious matching of colors made the line blend with a chameleon-like quality. The staircases had covered openings on front and back which swallowed up members laying on the ground to the crowd’s amazement. 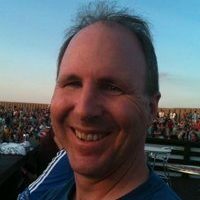 Petal HS (MS) (10th – 89.675) used large video monitors to help a man tell how he and his father used to love going to a pier in “Oceans Deep.” The man, standing on a long wooden pier with a bell, described how his dad told him to write down what he wanted and cast it in the sea. If the bottle returned, his dreams would come true. While many of the memories were fond as photos flashed on the screens, there was one he couldn’t forget: During a storm, when his father wanted to leave and the man didn’t, the pier broke and his father drowned. The now-grown man cherished the good memories as he put the pier back together in his mind, ringing the bell one last time. Lebanon HS (OH) (11th – 88.7515) paid homage to legendary British rock band Pink Floyd with “Pink.” Set in front of a large white curved brick wall with a black triangular stage in the front corner, the line drew heavily on imagery from the band’s most renowned albums. The triangular stage became the prism from the cover of Dark Side of the Moon, with lights separating into a rainbow of color as a fantastic trumpet soloist played high notes while playing a bass drum at the same time. At the finish, with melodies form Another Brick in the Wall still fresh in our minds, one male screamed as wall came crashing down, revealing hot pink on the other side of the bricks. 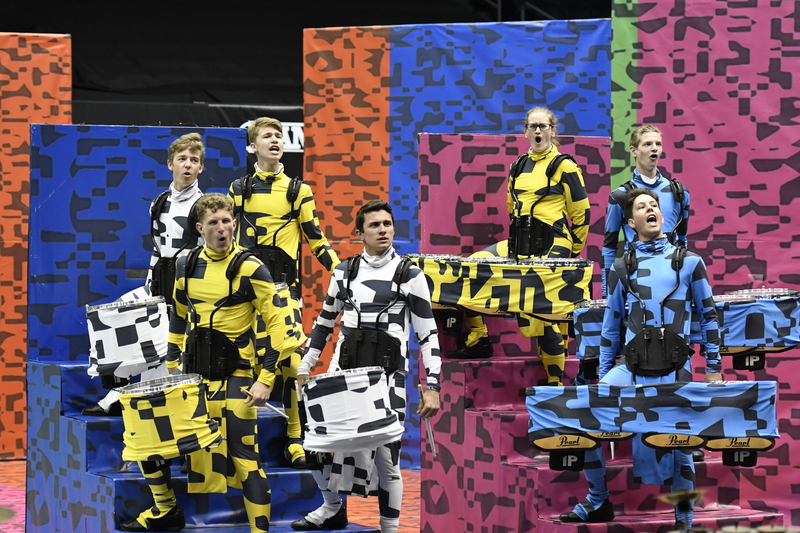 Center Grove HS (IN) (12th – 86.650) did a musical take on a Ray Bradbury classic in “Fahrenheit 433.” Set in a dystopian future where leaders came first for books, then art, and finally music, the unit defied the oppressors to fight for the right to be creative. Three large glowing red pyres with drums and burning sheet music combined with sounds of burning paper added to the unsettling atmosphere. With Sara Bareilles Once Upon Another Time serving as a constant thematic thread , the show had hints of sad nostalgia for a more innocent time. Ultimately, the rebels won as red banners spelled FREE on the ground at the powerful conclusion. Milton HS (GA) (13th – 86.175) provided a clever twist to a Disney classic with “The Inventor’s Apprentice.” Performed in his workshop with a sign reading 1797 DAYS WITHOUT RUNAWAY ROBOTS, he left his apprentice in charge to clean the place while he was away. The instruction to not touch the robots was too hard to resist, and soon the youth was maneuvering them with a remote control. Unfortunately, they malfunctioned and ran amok. Luckily, the inventor returned to shut everything down with a giant emergency stop button. Furious, he swatted the lad out of his shop with a broom, changing the 1797 to 0. South County HS (VA) (15th – 85.325) told the tragic tale of Orpheus from Greek mythology in “Don’t Look Back.” At the start, Hades tells the hero his beloved Eurydice, who died from a snakebite, may follow him back to the land of the living. However, there was a catch: If he turned around to look at her before leaving the underworld, she would be forever lost. As they journeyed upward, he resisted the overwhelming temptation to gaze upon her face. After an emotional dance to the accompaniment of a poignant violin soloist, he turned around too soon as hooded fiends dragged her away screaming.